I have a thing for spices, and for Taco seasoning. ‘A thing’ meaning I cannot stop buying them even if I don’t use them. I use a lot, don’t get me wrong. It’s just that cardamom pods and Bell’s poultry seasoning aren’t exactly things I use every day. I needed them for a particular recipe and bought them, then they got lost behind the myriad other spice bottles in my closet that undoubtedly fall out onto my head when I’m digging around for something. I took Thomas grocery shopping with me the other day and he decided he wanted tacos for dinner this week. Which was fine because tacos are in our regular line-up anyway. The weird thing was that he wanted them to be filled with beef. BEEF. My kid has never ever in 9 years eaten beef and yet now he requests it? We have done black bean or refried (homemade) pinto bean tacos for years but never beef. Backstory: Fletch and I are always looking for new places when we dine out and I’ll often have leftovers and offer The Boy a taste. My peeky leetle beast will not try anything and will be terribly vocal in his disgust over my food choices. Fine, no problem. What. Ever. Imagine his surprise when I said no. Who knew restaurant dining was so important to a little kid? 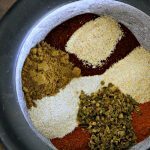 Blend the ingredients together with a spoon - or if your child wants to help, allow them to combine the ingredients with a mortar and pestle. Store seasoning mix in an airtight jar away from heat and light. To make tacos, cook 1 pound of ground beef (turkey, chicken, gator) in a skillet until no longer pink. Stir 3T (+/- to taste) seasoning mix and about 1/2 cup water into the pan with the meat. Let meat and spices simmer a few minutes to thicken then serve in heated/grilled tortillas with your favorite toppings. * Of course, you can always use this mix with beans or tofu or even to sprinkle on veggies for grilling. I think it would be terrific on grilled corn with a spritz of lime juice. * Jack up the heat by adding cayenne pepper or use chipotle chile powder in addition to or instead of the smoked paprika. Chipotle has a similar smokiness to it. * My favorite source for spices in the mail-order giant, Penzey’s. If you can find a retail store, please stop. They have most of their spices and dried herbs/blends on display in jars so you can smell them and see what you like! * If you order from Penzey’s, get the big bag of cream of tartar (great price!) if you plan on making the Cinnamon Sugar Cookies I posted recently. Once you try them you’ll be making them all the time. * I think spice blends like this make great gifts. Package it up in a pretty jar with an adorable label and add it to a basket of taco paraphernalia (perhaps a few margarita glasses and tequila, salsa, tortillas, avocado for guacamole). I’d be thrilled with this gift! I read this article and found it very interesting, thought it might be something for you. 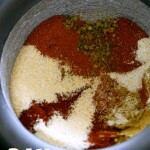 The article is called DIY Taco Seasoning Mix and is located at https://thefarmgirlcooks.com/diy-taco-seasoning-mix/. I’m liking your tactic on the restaurant meals and may borrow your idea with our grand kids. Brilliant. And we will try the Taco seasoning. This ‘tactic’ has been a long time in the making, actually. Not that I put any thought into it, exactly, but I just grew tired of having to deal with a pouty boy who turned his nose up at everything without even trying. I refuse to let him ruin a nice dinner. At 9 years old he should be a little more open-minded. Funny thing, when he was 2 and 3 and 4 he would eat almost anything! I don’t know where his strong-willed personality comes from! I love spices too. Sounds and looks delicious. I came up with almost the same recipe a while ago for my dad when he couldn’t have all the salt in the premade stuff. I add a smidge of tomato paste too. Laura, one of my friends on FB just said she added tomato powder to the mix. I wanted something tomato-y in there but didn’t have any paste. I may have to search for this powder!